Spicy tomato, onion and ginger curry sauce with mixed spices in individual pouches. Chilli rating - hot - 3. Distinctive & intense. Serve 2-3 in 10 mins. No artificial preservatives, colourings or flavourings. Suitable for vegetarians. A versatile Indian recipe, delicious with all meats, vegetables, seafood, paneer and eggs The Spice Tailor range is truly versatile. Simply take your pick from the bits to buy, add the specially selected spices, stir in the sauce and you have a fresh, authentic Indian meal in just 10 minutes! 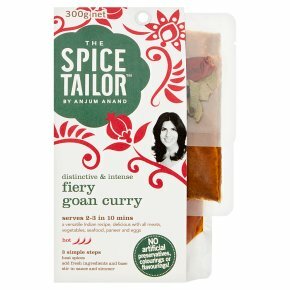 Our Fiery Goan Curry fuses mellow tomatoes, sweet onions, fragrant spices with definitive vinegar and fiery chillies to create a spicy, moreish curry with a firm Goan provenance. The Spice Mix Dried curry leaves for aromatic warmth Clove for pungent sweetness Black peppercorns for heat Whole red chilli for clean heat Sauce Facts The Portuguese colonised Goa for 450 years and Goans soon became adept at harmonising their flavours with local ingredients. Many of the dishes we recognise today as Goan have a strong Portuguese influence. In fact, these sea-farers brought with them many of Goa's prized ingredients including chillies from South America. Our Goan curry reflects the flavours and history of this lush Southern Indian state, with a special blend of spices tomatoes, vinegar and of course chillies; it is unapologetically Goan and delicious! 3 simple steps Heat spices Add fresh ingredients and base Stir in sauce and simmer Not suitable for microwave use.